What Is the Difference Between Hard Torque and Soft Torque? Apparently, there exists a fair amount of confusion about manufacturer claims surrounding what they call “soft torque” and “hard torque.” A quick Google search, at least at this point, doesn’t reveal a whole ton of useful information. And, manufacturers don’t seem to be terribly forthright with good working definitions of what these terms actually mean. So, as a public service, and also for my own edification, I feel that it might not be a bad question to toss to the Pro team and bring you some answers. So, what is the difference between hard torque and soft torque? Torque is torque, right? Nah, not really. Like many quantifiable results in the tool industry, there are plenty of variables in play. For example, try getting a solid torque measurement on any impact tool. You’ll find it’s a lot harder with a lot more gray area than getting it on a drill. The action of the impacting creates a very fast torque curve that’s incredibly hard to measure. The little details make a big difference. The difference between hard torque and soft torque boils down to what material you’re working with. The amount of available energy flowing to the chuck doesn’t change, but some materials give and others don’t. You’ll get the closest to hard torque ratings when you’re fastening metal to metal – particularly stainless steel. There is such a thing as a soft metal and you won’t read as a high a torque in that as you will harder metal. Furthering that point, driving a fastener in soft wood will reduce the amount of torque the drill produces. The nature of woods – like pine – to give as the fastener head reaches the end of the drive means the driver encounters a “squishier” end. It’s the difference between punching a brick wall and a pillow. You register more force against the wall because it doesn’t give in to your hand (which is now broken, incidentally). Punch a pillow and you can’t register as much force because the pillow gives into the strike. It’s less force, but there’s no doctor’s bill to worry about. What’s interesting is that you’re unlikely to come across the actual hard or soft torque numbers. The metal used in making fasteners varies as does the material. For instance, your drill can produce harder torque in oak than it can in pine simply because the oak is a harder wood. However, it will still fall well short of the hard torque value. Most of the time, you’ll be working with torque that is in between the hard and soft ratings. Pro Tip: When a manufacturer cites just “maximum torque”, that’s a hard torque value. So, the difference between hard torque and soft torque is this: hard torque is how much the driver will produce when you’re working with hardened fasteners and material like stainless steel. 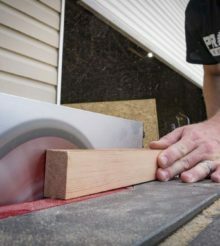 Soft torque is the maximum torque you get when you’re working with softer materials, like pine.